Admission notification for online applications. Online form for this BCECEB ITICAT 2019 will be active till the last date of 03-04-2019. BCECEB ITICAT Exam consists of 3 sections (Maths, General Science, General Knowledge). BCECEB ITICAT Exam will be conducted for 300 Marks. 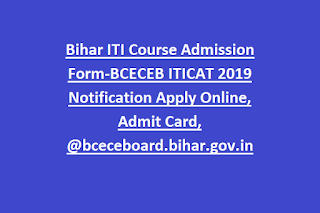 BCECEB ITICAT 2019 Important Dates, eligibility criteria, ITICAT Admit Card, Result, counseling dates, and other details of Bihar ITI Course Admission information is updated below. 10th class qualified candidates eligible to apply for this BCECEB ITI Entrance test. As on 01-08-2019 lower age limit is 14 years. For Tractor Mechanic and Motor Mechanic Trades lower age limit is 17 years. BCECEB ITI CAT Exam will be conducted for 300 Marks. Total 150 questions will be given and each questions carries 2 marks. ITICAT Exam duration is 145 minutes. Exam syllabus is 10th standard syllabus only. Admit card for this ITICAT Exam will be available on 18-04-2019. It is mandatory to carry the admit card to attend the exam. Using registration id or application number and password or date of birth candidates can download the admit card. 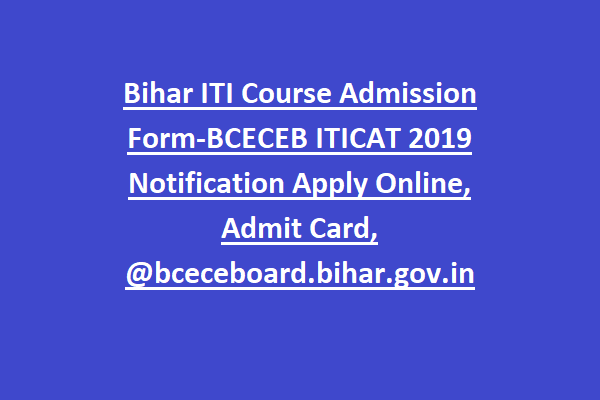 Apply online for this Bihar ITICAT Exam on or before 03-04-2019. Official website to apply online for this Bihar ITI Course admission is https://bceceboard.bihar.gov.in/.